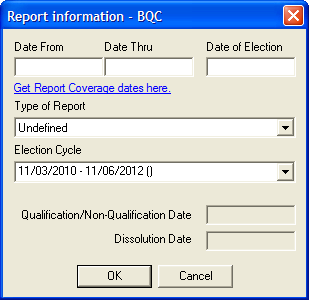 Candidate Committees � A Candidate Committee that has submitted prior campaign statements during an election cycle is required to enter previous receipt and expenditure data in order for the software to account for all cumulative totals. For example, a committee that has received three previous contributions during the current election cycle from a person, and is starting to use MERTS to report a fourth contribution made by the same person during the current reporting period (the first report to be filed electronically using MERTS) would be required either to enter all four contributions, or the current contribution plus a single contribution for the total amount of the three previous contributions. In this case, the three prior contributions may be reported as a single total dated in a previous period. 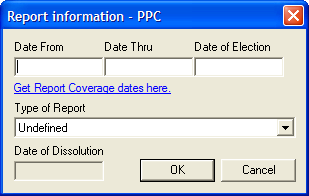 The exact date is not relevant for a correct cumulative to show for the election cycle (as long as the date indicated does fall within the election cycle). Loans/Debts - All existing outstanding loans and debts must be individually entered (referencing the actual dates) to enable the software to continue tracking the loan or debt (and any payments) until the balance is brought to $0.00. It is important to note, however, since the entry of such a transaction of funds received as past loans will add that amount of the committee�s asset totals, it may become necessary to create an administrative expenditure dated prior to the start of the first electronic report in order to arrive at the correct starting balance for the first electronically filed report. 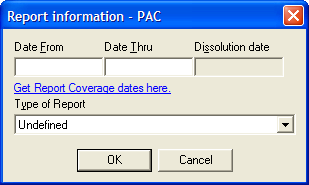 Note: As of March 10, 2000 all Michigan candidate committee, PACs and other committees are required to itemize all receipts regardless of the amount. MERTS incorporates an �Itemize All Receipts� option and a separate �Itemize All Expenditures� option to allow committees to itemize all receipts and to itemize all expenditures regardless of amount. 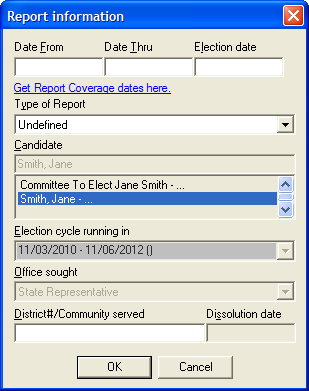 If an Independent or Political Committee made contributions to any Candidate Committees, the cumulative of all contributions made to each separate Candidate Committee (during the current election cycle for that candidate) must be entered as a total amount for any period of time prior to the first report submitted using MERTS. If a Political Party Committee made contributions to any Candidate Committees, the cumulative of all contributions made to each separate Candidate Committee (during the current election cycle for that candidate) must be entered as a total amount for any period of time prior to the first report submitted using MERTS. If a Ballot Question committee made contributions to any other Ballot Question committees, or independent expenditures supporting or opposing ballot proposals, the cumulative of all expenditures made (during the current election cycle for that proposal) must be entered as a total amount for any period of time prior to the first report submitted using MERTS.